The irregular warfare that has marked the conflicts of the 21st century saw a rapid evolution of many technologies to engage a new enemy in a new way. Perhaps none so dramatic, at least in the public eye anyway, as the increased use of Unmanned Aerial Systems, known more colloquially as drones. IAI Photo: © Israel Aerospace Industries. When America invaded Iraq in 2003, it did so with a few hundred drones, by the time it left, it had almost 10,000. Unmanned aircraft are not new, in fact they have been around for decades. What has changed is, thanks to today’s Global Positioning Systems (GPS) and Tactical Data Links (TDLs), they can now send back incredibly large packets of data, which has made them invaluable for intelligence, surveillance and reconnaissance (ISR) missions to all levels of our increasingly information dependent armed forces. Beyond ISR capabilities, large scale drones have the ability to travel great distances, acquire targets and fire missiles. 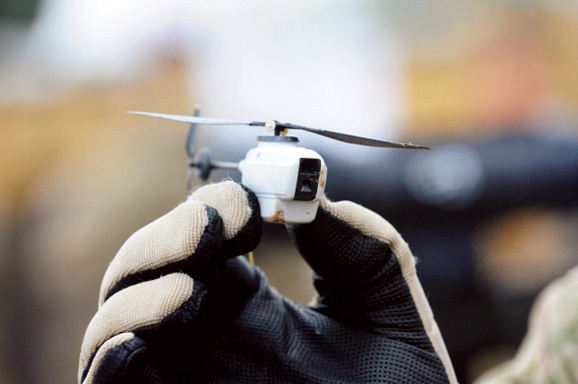 While these systems such as the Predator and Reaper have grabbed headlines for “drone strikes,” the military is now focusing on the current and future use of smaller, and even micro and mini drones that can used by dismounted soldiers. These lightweight unmanned aircraft, are not much bigger than a hobbyist’s typical RC airplane, and are almost as simple to operate. 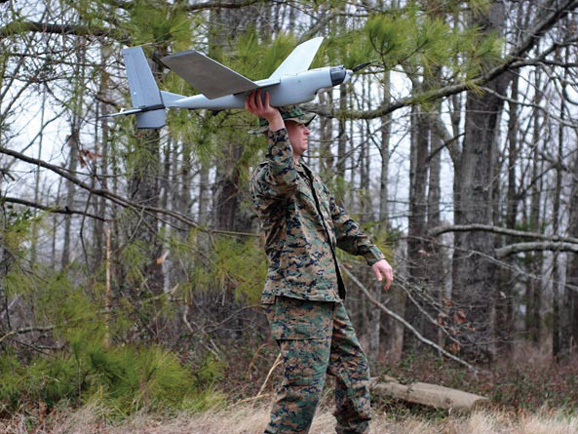 Able to literally be launched by hand, this subclass of drones, known as Small Unmanned Aerial Vehicles, or SUAVs, are designed to provide valuable ISR and communications, including real-time tactical reconnaissance, tracking, combat assessment and geographic data, directly to a small tactical command unit or even to an individual warfighter. SUAVs are able to securely transmit critical live video and other information generated by their payload of sensors and cameras, enabling the operator to view and capture images, day or at night. In countless operations SUAVs, such as AeroVironment’s Puma™ AE, Raven®, Wasp® AE and Shrike VTOL™ have proved to be invaluable, enabling tactical commanders to observe around the next corner, to the next intersection or past the ridgeline, all in real-time. This past May at the 2014 Unmanned Systems exhibition held in Orlando Florida many such SUAVs were on display including new offerings from Israel Aerospace Industries and Stark Aerospace. Black Hornet. Photo: © MoD Crown. If the introduction of SUAVs had certain advantages over their larger cousins, the military is now also looking towards the benefit of greater downscaling into the realm of mini and micro-drones. DARPA has already developed and deployed the Wasp, “micro air vehicle” which weighs only 0.2 kilograms and has a wingspan of a mere 36 centimeters. The insect-like mini-spy can hover in the air for more than an hour, and can fly at speeds of up to 56 km/h, providing real-time imagery, while remaining almost undetectable. DARPA has also introduced other small drones, including the Hummingbird, which weighs less than a single AA battery and resembles its namesake in both form and function. This kind of advancing technology means most infantrymen can now carry a pocket-sized drone that can be used to acquire targets and detect the enemy. Last year, the UK’s MoD showed off the Black Hornet, a nano-drone that was issued in the kit of every British Soldier in Afghanistan. It measures just 10cm by 2.5cm but is able to relay full-motion video and still images back to the operator. The US Army continues its Micro Autonomous Systems and Technology (MAST) program, which began in 2007. MAST is a collaboration between a number of teams drawn from industry and academia and the Army Research Laboratory. Like the “Wasp,” “Black Hornet” and “Hummingbird,” MAST continues to take inspiration from the animal kingdom, developing micro robots that resemble, flies, spiders and lizards.